The newborn planet, named PDS 70b, orbits a dwarf star and is at a distance of almost 370 light years from Earth. It falls in the constellation Centaurus. 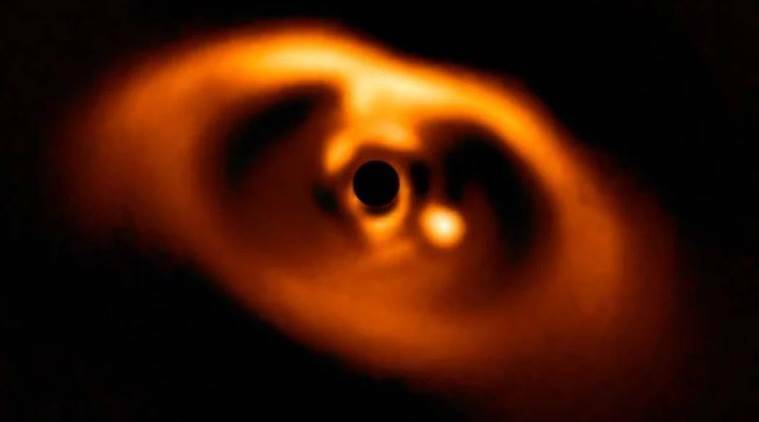 The newborn planet was named PDS 70b by scientists who discovered it. Scientists have captured the first confirmed image of a planet being formed. The discovery was made by scientists at the Max Planck Institute for Astronomy in Germany, where they captured the planet forming in the swirling dust of a young dwarf star. One of the most powerful planet-hunting instruments on Earth, the SPHERE on the European Southern Observatory’s (ESO) Very Large Telescope, was used to capture the moment. The planet, named PDS 70b, orbits a dwarf star and is at a distance of almost 370 light years from Earth. It falls in the constellation Centaurus. The dwarf star, the PDS 70, is less than 10 million years old, while its planet companion is about five to six million years old. In terms of size, however, this infant planet has a mass that is almost two-three times the size of Jupiter. The image has been published in the Astronomy and Astrophysics journal as part of a new research. “These discs are the birthplaces of planets, but so far only a handful of observations have detected hints of baby plants in them,” Miriam Keppler from the Max Planck Institute said. It is located roughly three billion kilometres from the central star, which is approximately the distance between the Sun and Uranus. Since the planet is still in its nascent stages, its surface has not cooled down and is at a temperature of about 1,000 degree Celsius, making it hotter than any planet in our solar system.